Geography in Kindergarten? Yes! Where is Robin? To a five or six year old child, the “world” may only be the immediate community he/she lives in. It is our job as teachers/parents to help children see there is more of the world to explore. It is our job to present material that is engaging, that fosters discussion and gets children thinking about the possibilities. And, it is especially exciting to see children make connections with their own experiences to places they are learning about. I have had the opportunity to review a wonderful book! A book that helps children make connections with geography, invention, music and more. Just imagine seeing this world through the eyes of a little robin who is very brave. Imagine beautiful illustrations and engaging text that reinforces the concept of rhyme. Imagine expanding your students’ vocabulary with rich descriptions about well known places in the United States. 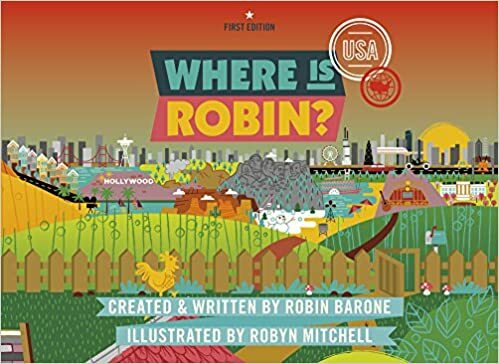 This is the perfect recipe for an early years geography book, and its name is Where is Robin?, by Robin Barone, Illustrated by Robyn Mitchell. Children will learn about the Grand Canyon, New York City, The White House, The Lincoln Memorial, Washington D.C., and many more historic and well known locations. They will see Fenway Park, and get to follow Robin to Detroit where she takes a ride in an original Model T. In New Orleans and Nashville Robin will experience a bit of our country’s rich musical heritage. Robin helps students know that our country is diverse, rich in ambition and full of possibilities. Where is Robin? provides a wonderful first experience learning about places we can visit in our country. It will help plant the seed of exploration in little minds, and help them imagine where they will travel on their own someday. It would make a great take-along on road trips! The author is well traveled, so I would expect more Where is Robin books to follow. This one is a keeper!